The IB extended essay is a research based mini thesis with a word count of 4000 words, writing which is no walk in the park. It requires months of preparation in the form of research and thought. This blog focuses on the basics of writing an IB extended essay. The first step is to choose your research question(RQ). Easy as it may seem, this is the step that requires a lot of thought and research. It would be helpful to choose your RQ based on a subject of interest so that the thesis might not seem like a tedious task for you that you would rather not do. One of the main challenges is choosing an RQ that could be discussed while keeping within the word limit of 4000. A topic that is too specific might appear stretched when you try to fill up for the sake of word count. On the other hand, do not choose a topic that is too vast either because you might not be able to come to a valid conclusion within the word limit. Another concern is making sure that your chosen topic has enough information online or otherwise that you can access for your research. Other than online and in libraries, information on your topic can be found by discussing it with experts in the field. More than just doing a whole lot of research and collecting a plethora of information, an IB extended essay is about proving how much of an understanding you have on the course concepts. At the end of the essay, it must be obvious that you have grasped the concepts well and are able to arrive at a logical conclusion. The final thing to consider is if the topic will be of any help to you in future. A well written essay on an excellent topic could fetch you the opportunity to get into your preferred university program. Or it would help you in deciding your future course of study. At the end of the day, a work of passion speaks for itself. It would be infinitely helpful to be have some underlying motivation in order to produce that perfect essay. If you are an IB student, you probably know the challenge involved in writing a TOK essay that conforms to the format and fetches high marks. With the following guidelines, you can save your valuable time and focus on the content. TOK stands for Theory of Knowledge. A TOK essay talks about how we come to know things. While discussing the chosen topic for the essay, one has to present two sides of an argument, known as a claim and a counter-claim, with evidences supporting each side. It is imperative that the evidence supports the claim/counter-claim. The first step is choosing your topic from the given list and a valid Knowledge Question (KQ). Think over the topic and make a few notes in relation to your understanding on the topic. · Begin the essay with an interesting sentence related to the topic. This could be a quote or a fact. · Provide definitions for two or three terms in the topic. · Provide your initial answer to the knowledge question. · Write a preview on the essay. For instance, introduce the AOKs and WOKs and the main claims that will be debated. · Argue the claim by presenting a counter-claim and explain it using a real life example. · You may begin by using words like ‘However’, ‘On the contrary‘ etc. · End the discussion by summing up and linking to the title. 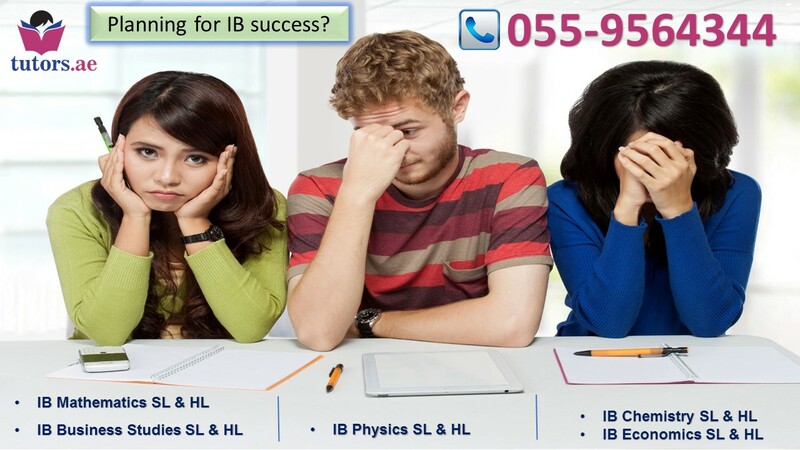 Dubai based, IB experts tells us how one can plan IB’s success. 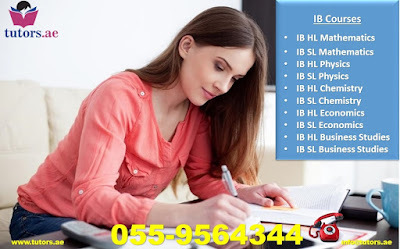 They are expert and experienced IB teacher of Maths, Physics, Chemistry, Economics and Business Studies in Dubai. Since it’s the beginning of the new session, it is quite a fun loving time. Old students come back from the vacations, whereas new students join the school. It is the time for great opportunities, to start afresh and make a great success. 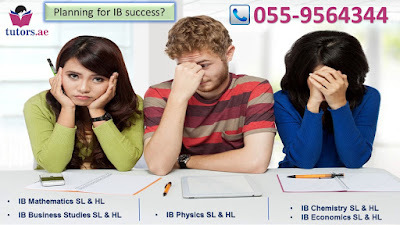 Is your ward, daughter or son thinking to opt for IB exams? Are you tensed about how he or she is going to face the examination? In this situation ample number of factors plays a major role and some of these are school support mechanisms, personality of your ward, daughter or son, home environment and a lot more. We have found out some useful tips that can help your child to face the IB exams with confidence. Additionally, since “your ward, daughter or son”, is taking a lot of space, in this blog we have given your child a name i.e. “JACK”. 1. Start Early: It is very important to start early as it gives a lot of confidence. JACK should start revising early. · Physical Support: Physical needs of JACK should be looked after very properly as the examination is nearby, revision has to be harder. You can make the environment around JACK comfortable, space has to be given, stationery items should be stocked and even fridge should be stocked. You should also encourage JACK to do regular exercise, get enough sleep, and eat healthy (avoid caffeine and sugary foods). · Emotional Support: Exams are quite stressful for few students which include JACK as well. It become tensioning as the results holds their future. In such cases emotional support of families and friends is required. There are two things: firstly you should believe in JACK and secondly, listen. You aren’t required to rush whenever JACK is stressed, the situation is absolutely normal, you should encourage him/her to face it and calm down. Advices shouldn’t be given rather space and time has to be offered. Thirdly, appreciation is to be shown. Results are not being focused on, efforts and hard work put in by JACK has to be looked into. Make him/her feel that you are proud about the massive development and mature behavior that he or she has shown up in that particular period. 3. Understanding the work load: With strict deadlines JACK has to meet by the end of the course you should understand it. IB requires 20-30% of submission in the final grade. Apart from this completion of CAS is also required. Since JACK has to get good grades, it is important from him or her to realize that these deadlines are to be looked into very seriously. Outstanding support has to be given to JACK as there are internal assessments also. In such cases you should think about: Are there any commitments JACK has outside the school? Are there important? Can those be scaled out after IB exams? Mental symptoms: nail biting, lack of interest and concentration. If you see any of these signs then it is clear that JACK is very stresses and he or she requires emotional, mental and physical support. You need to calm him/her down and ask for relaxing. One of the best relaxation techniques is breathing. In fact you can do it with JACK. Teachers: If JACK knows that teachers are by her/his side, he or she will definitely perform better. Since every teacher is expert in his or her subject they can help JACK in the best possible way. They can help him in solving particular issues thus making it easy for him or her to study. Syllabus: Each subject guide is produced by IB. JACK should have copy of each of them. He or she should be accessing their important part which includes grading of assessments. Notes: Ample of handouts and notes are given to JACK in the beginning of IB Diploma. JACK should see that notes are completed. Then it is to be recognized that how they should be studied, certain revision techniques should be followed and also the notes can be complied into mnemonics, bullet points, diagrams, mind maps etc. Textbooks: IB textbooks are available in wide range but in some institutions teaching is done with non IB books. In such cases, these books hold less significance. It is recommended to use revision guides in the final stages and not the textbooks. Past papers and mark schemes: JACK should know about marking schemes and past papers as they are very useful. But also, he or she should properly look into the changes made in the latest IB syllabus. JACK’s school can have an access to multiple papers in various regions and examination sessions. Rules of the paper should be known by JACK. Revision advice: Nobody is prepared till the last day of examination but revision is a must. Apart from what JACK’s school is providing, topics for revision can be looked online also and two best examples are Skills4study and BBC. These websites have best of the IB papers that have proven to be very useful. Universities like Manchester, Worcester, Southampton, Loughborough, Brunel have given paper son these websites. Study Buddies: Many children are comfortable in group studies whereas some like to study alone. In such case you should see what JACK prefers. When children study together they can boost each other’s morale, thus supporting each other in many aspects. Parents and family: You are JACK’s support system. Since IB is a very tough examination, it is known as one of the most respected academic programme. You need to support him to face this challenge fearlessly. Deal with JACK very patiently; give him or her lot of support and love. Once JACK’s examination is over, you need to celebrate it. Recognize his achievements, look into the difficult path is gone through and then enjoy the outcome. If you are a student of the International Baccalaureate (IB) program, you’re already getting ready to writing your Extended Essay. 1. The IB Extended Essay, as the name infers, is a long 4,000-word original copy like a smaller than expected proposal or a novel – genuinely a testing assignment. One must be overcome enough to do it or you're essentially only a greatly skilled or talented understudy. In any case, you need to acknowledge the gravity of the circumstance soon enough so you can begin on what should be finished. 2. Choose a subject matter that you really, really like because you’ll be spending a LOT of time writing about it. Start by figuring out which classes you enjoy the most and why you love them. Determine the level of personal involvement you are willing to do for it because your resolution will be your lifeboat when you already made a draft for the nth time. 3. Writing 4,000 words for the first time is an outlandish ambition. The most important thing is you start writing ASAP and on a regular basis, gradually increasing the word sum as time passes by. Your first few drafts wouldn’t seem to make sense at all but you’re not aiming for perfection yet. Write as much as you can, as fast as you can, because you can correct wording and structure later on. 4. Your EE will most probably make reference to the works of others so ensure that your bibliographies are listed and formatted correctly. 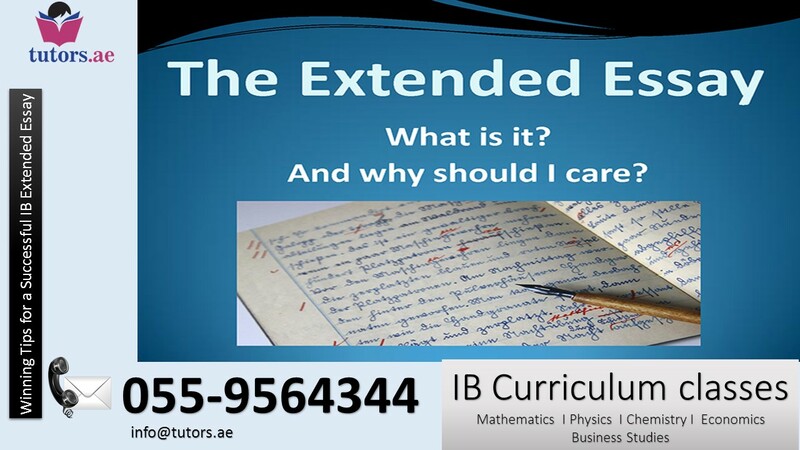 Tutors.ae provide IB expert tutors in Dubai for Mathematics, Chemistry, Physics, Economics and Business Studies. We believe that through a customized group tutoring experience, every student can gain the confidence and motivation needed to succeed. Our tutors.ae online facility is your essential writing consultant to help you create the winning essays you need. Students who are planning to attempt their AP exams in Dubai at AP test centers or at AP schools have extensive coursework to review. It is recommended to prepare the AP exam review strategy so that you have an idea of how to revise your AP course material. · Start by reviewing the course material that you have finished revising. Allot 15 minutes to assess what you have studied previously and revitalize your memory regularly. This is one of the proven strategies for effectual learning. · Embrace the new coursework that you are studying at present with a focus on your upcoming test. Keep in mind that what you have already learnt and have been tested for, you cannot forget so it is pointless to worry about the past. Whilst you work towards memorizing new material, keep a few minutes aside to prepare notes for your AP exam review. Make a note of the sections that you found difficulty in and attempt to handle these sections in your AP revision sessions. · Make use of the available revision papers available online. These papers are highly useful because you can break down the sections and find out the weightage that is given to each topic. You can also look up AP exam papers with answer keys, scoring structures as well as the material covered in exam papers. Last but not the least, don’t feel shy to look for assistance from mentors apart from your teachers. Your AP exams are too important to avoid asking for help when you need it the most. At Tutors.ae, our team of best AP tutors in Dubai are capable of providing AP exam revision classes, AP exam notes and AP exam tutoring so that your AP exam prep is on point and in line with your goals to achieve top AP scores. The broadened article is evolving! It is an independent, self-directed piece of research, finishing with a 4,000-word pa-per. Participation in this process develops the capacity to analyse, synthesize and evaluate knowledge. An extended essay can also be undertaken in world studies, where students carry out an in-depth interdisciplinary study of an issue of contemporary global signifi-cance, across two IB diploma disciplines. Beginning solid is dependably a decent position to be in. You have your thought set. You've begun your perusing. What could turn out badly? You have an arrangement. Approve it may be entirely essential for an Extended Essay, however, in any event, it's a brief comment from, eh? You've been chipping away at your Broadened Article for a couple of hours now. Certainly, time to take a break. They all appear to be quite a long ways ahead. Am I missing something? Is the Extended Essay due date nearer that you thought? It’s time to complete my Extended Essay, so be ensure it must complete before timeline. The acknowledgment occurs to you that the best way to tackle this circumstance is to get composition! And finally TIME TO Celebrate! I guarantee you, the sentiment submitting your finished Expanded Article is justified, despite all the trouble!